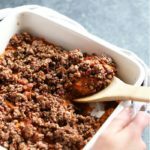 Get excited for the best BBQ side dish you will ever make! 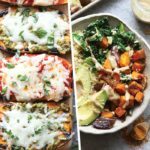 This baked potato salad is the perfect side dish next to bbq chicken, cheeseburgers, or would make a great meal prep lunch. 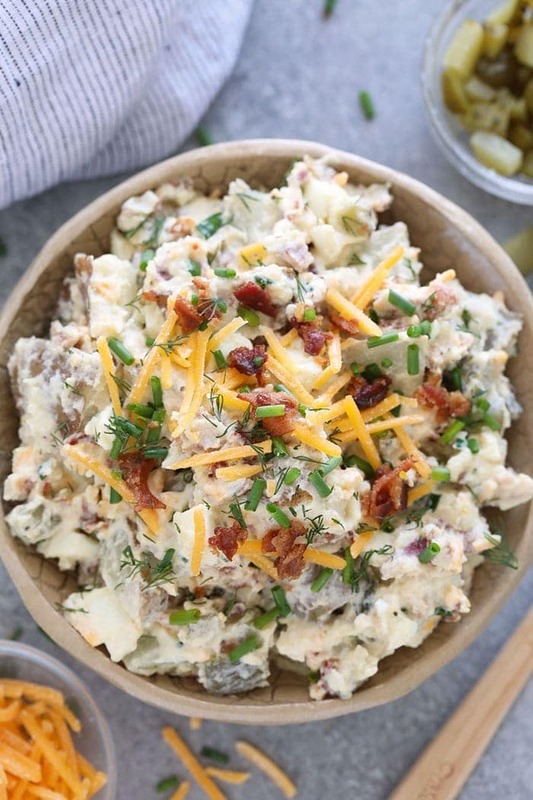 It is a loaded baked potato salad packed with bacon, cheddar cheese, pickles, hard-boiled eggs, and more! When the sun comes out and it’s time to get those tomato plants in the ground, it’s not only gardening season, it is potato salad season. 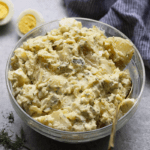 Last year we fell in love with our Instant Pot and as well as our Instant Pot Potato Salad. People went crazy and so did we. 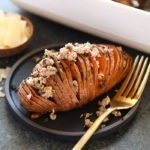 Not only are we in love with potato salad, but we love potatoes in all forms! We don’t discriminate against any spud at any time, but today the star of the show is this baked potato salad. This baked potato salad is perfectly creamy, crunchy, sweet, and tart all at the same time. Now lets GO. 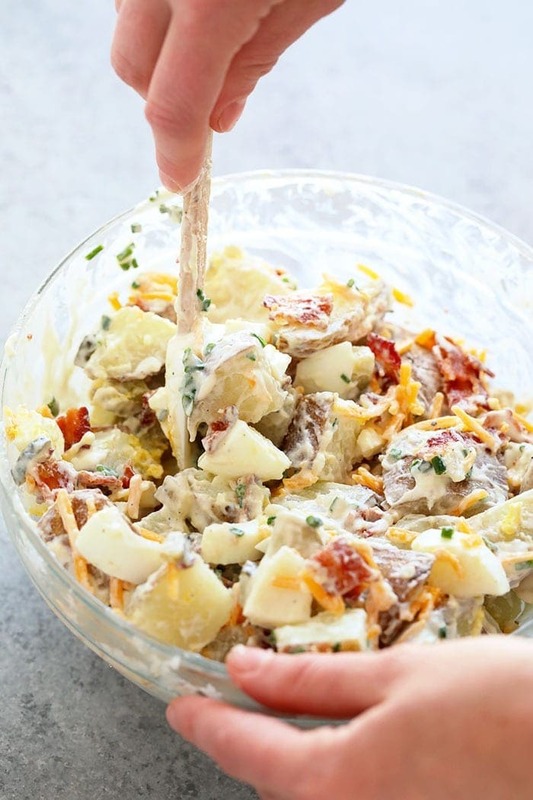 This baked potato salad is the perfect combination of a classic potato salad, loaded baked potatoes, and and summer time. This potato salad is ready in under 45 minutes and will blow the socks off your BBQ party guests. First things, first. Cook the potatoes. 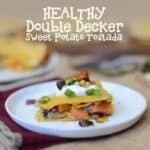 There are two options when it comes to preparing the potatoes this loaded baked potato salad. Boil the potatoes by cutting the potatoes into 1.5-inch chunks and boil them for about 15 minutes or long enough for the potatoes to be cooked, yet firm. Bake the potatoes whole at 425ºF for 45 minutes. Be sure to poke many holes in the potatoes before baking them. Remove potatoes from the oven and cut them (carefully) into 1.5 inch chunks. No matter how the potatoes are cooked, just be sure potatoes are cooked through enough that they will smash easily. A classic loaded baked potato is packed with cheddar cheese, chives, bacon, and sour cream. 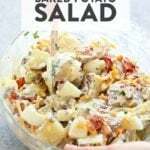 This loaded baked potato salad has those key ingredients plus hard boiled eggs and a delicious sauce made up of greek yogurt, mayo, lemon juice, dill pickle juice, pickles, and more. It just doesn’t get better than that! Prepare ingredients in order while potatoes are cooking. 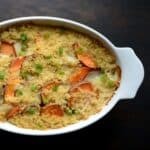 While potatoes are cooking on the stove or in the oven, prepare the bacon in the oven by following this How to Cook Bacon in the Oven post or cook the bacon your favorite way. 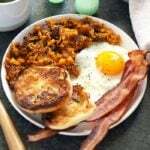 After potatoes are cooking and bacon is in the oven, chop all other ingredients, mix the sauce, and wait! The final step to making this baked potato salad a reality is to mix, mash, and chill the loaded baked potato salad. 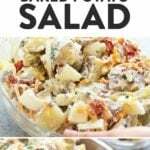 All you have to do is place all ingredients for the baked potato salad in a large bowl and mix well. I’m sure you’ve noticed in other potato salad recipes the potatoes are smashed a bit which creates a creamy consistency. 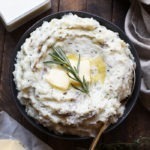 To smash your potatoes, take a wooden spoon and gently massage potatoes into the other potato salad ingredients. Try your best not to completely puree the potatoes. You want to just tenderize them a bit so part of the potato becomes part of the sauce. Lastly, place potato salad in the refrigerator and chill for at least 30 minutes before serving. 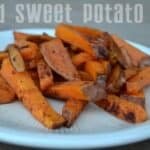 Get excited for the best BBQ side dish you will ever make! 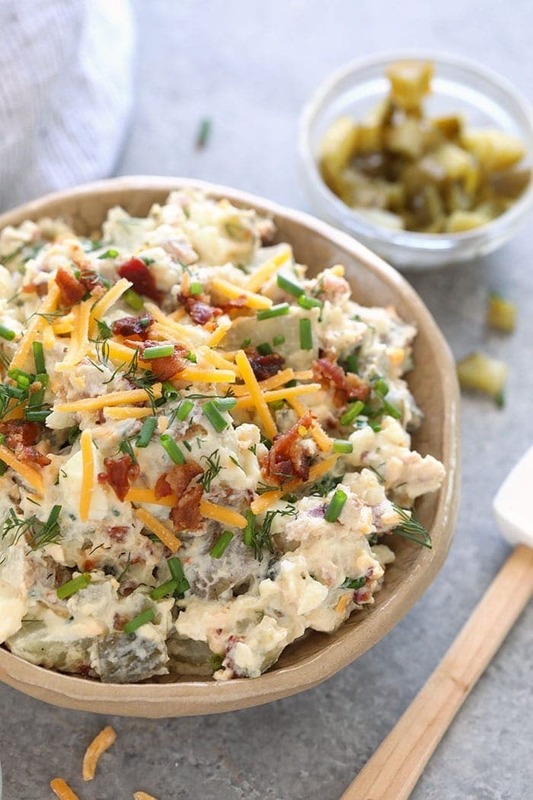 This baked potato salad is the perfect side dish next to bbq chicken, cheeseburgers, or would make a great meal prep lunch. 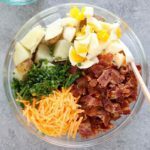 It is a loaded baked potato salad packed with bacon, cheddar cheese, pickles, hard boiled eggs, and more! Begin, by cooking bacon by following our How to Cook Bacon in the Oven tutorial. Next, bring a large pot of water to a boil and add potatoes to the pot. Boil until potatoes are cooked, but still firm. 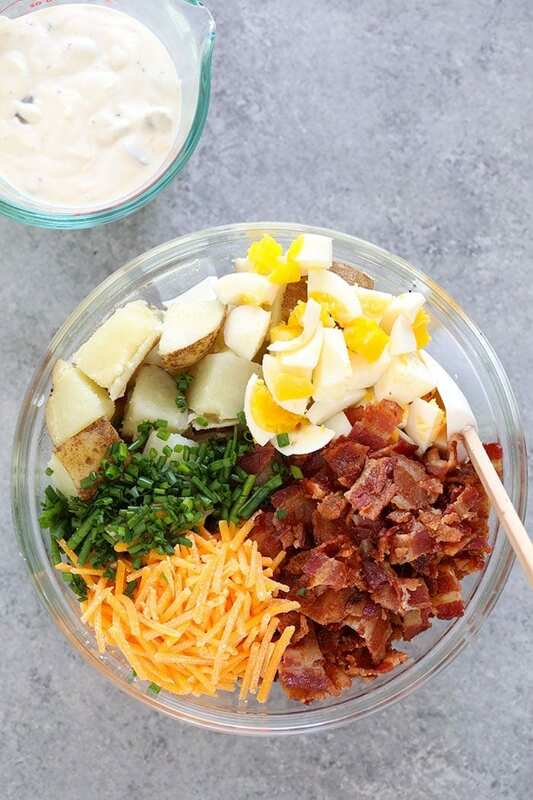 While potatoes are boiling, mix all ingredients for the potato salad sauce in a medium bowl. Set aside. When potatoes are done cooking, remove from heat and strain water. Add potatoes to a large bowl along with the hard boiled eggs, shredded cheddar cheese, and chives. Mix well. Finally, pour potato salad sauce over the potato mixture and mix until sauce is covering all of the ingredients. Mash the potatoes with a wooden spoon (just a little bit) to create a creamy potato salad consistency. Eat immediately or chill in the fridge to eat cold for later. *avocado mayonnaise: option to substitute normal mayonnaise. ***dill pickle juice: you get this directly from a jar of pickles. If you do not have this, feel free to sub apple cider vinegar. 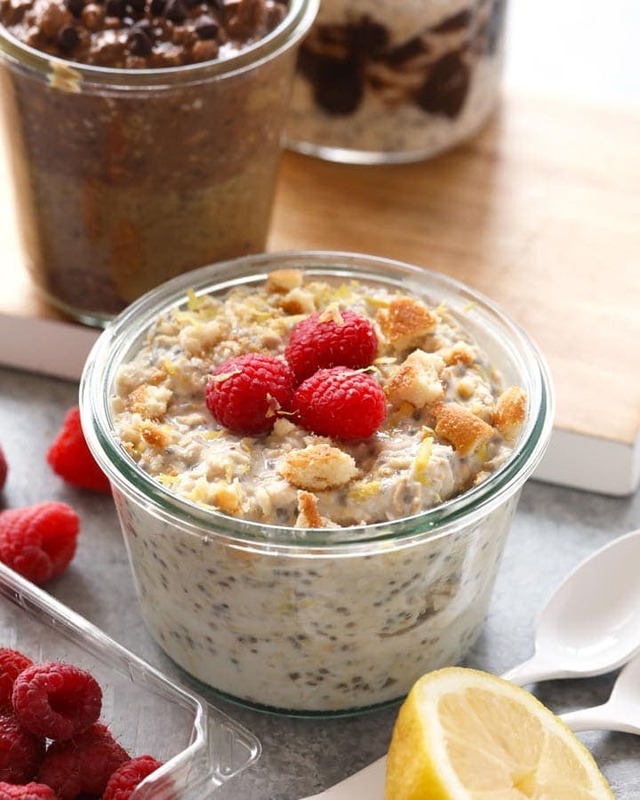 Storage: store in an air-tight container in the refrigerator for up to 5 days.